PlexiDor pet doors do not require costly vinyl replacement flaps. The dog doors feature a unique saloon style design, and swing open so easily that larger and smaller pets can use the same door. The dog door panels are made from a shatter resistant, thermo-pane, hardened acrylic. Both panels on the dog door are lined around all four edges with snug fitting, high density, industrial nylon pile weather seal. The panels swing open easily and close tight, providing superior draft-control, and reducing air conditioning and heat loss. 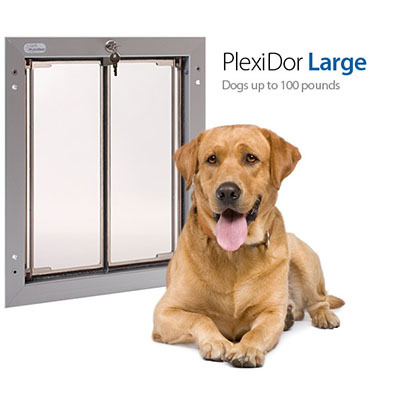 Whether you live in the hot desert climate of Arizona or in the frigid cold of Alaska, a PlexiDor dog door will save you money each month. Your pet will love the smooth, quiet, and safe doors. You will love seeing a lower energy bill.